Many congrats to England's women on their Six Nations Grand Slam which was never really in doubt. With a points difference of 233 and an average score per match of 55-9 this really was as straightforward as it gets, not massively surprising given that England were the only fully professional team in the competition. 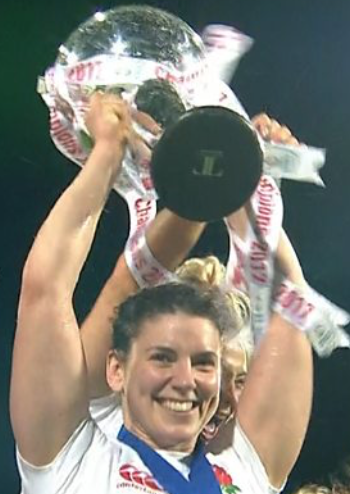 It's great that England's women are being rewarded, but given their utter dominance it is incumbent on the powers that be to ensure that standards are raised across the board - a title sponsor for the Women's Six Nations would be a good start. After all, while the England women can, in the short term, bask in their much deserved success, without meaningful competition the women's game will simply atrophy in the longer term. First thing to say is that England Women were awarded their professional contracts in January this year. Their professional attitude to training,team building, leadership, etc. however predates the contracts and the money. Looking back over a couple of seasons some things to note are that Scotland has hardly competed and in a fair world would have been replaced by Spain. Wales are making some progress but have a long way to go. Italy are a much improved side and, in this tournament, despite being an "amateur" side did well to see off "semi-professional" France 31-12 as well as coming in runners up. France don't seem to know whether to be semi or full time professional and this appears to be reflected in their much poorer performance this year than last time. Tragically Ireland are a shadow of their former selves with just one win in the competition. A lot of this is directly attributable to the turmoil generated by their union's attitude to women's participation in rugby. Fortunately for them Scotland are still in the tournament. I'm not sure the current crop would have got past Spain. Finally, any unbiased observer, and that doesn't include me, must recognise that the current England squad, including some very experienced and talented players, and some young and extremely dynamic players, particularly those attacking forwards, has set down a marker for what the other unions should be aspiring to deliver. This was never just about money, Italy have demonstrated that. The reality is that the game can only advance when the other unions provide the resources to allow their players to compete on a level playing field. Days of the Jackal numbered? Six Nations 2019: a Grand Slam for Wales? England Rugby: What is the point of Dan Robson?